Our Calgary dentists are often asked if it is safe to whiten (bleach) their teeth. Here, they provide some answers to put patients' concerns to rest. Teeth whitening is a cosmetic procedure, and as such, does not come with any oral health benefits. That said, many patients find that teeth whitening helps them feel a little more confident when they smile. As we age, our teeth can become discoloured. This may happen for a number of different reasons, from cigarette smoking or eating and drinking habits, to damage, decay, and even as a result of taking certain medications. If you would like to minimize the appearance of this discolouration, teeth whitening is a minimally invasive, safe and effective treatment option. You can visit your dentist for professional whitening treatments, or try over-the-counter whitening products from your local pharmacy. Professional whitening treatments are safe provided they are used as prescribed by your dentist, and over-the-counter products are also normally safe as long as you follow the package instructions. Professional teeth whitening is overseen by a dental professional, and so any problems that might arise can be dealt with before they become serious. 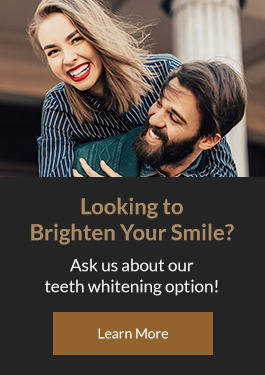 Professional teeth whiting uses stronger teeth bleaching solutions, which usually makes them more effective more quickly than over-the-counter products. As a result, you may need fewer treatments to achieve the effect you desire. It is possible to damage your teeth if you whiten them on excessively, so be sure to talk to your dentist about how many treatments are required, and what frequency is safe. Keep in mind that teeth whitening only works on natural teeth, and not on dental restorations. If you have or need dental restorations, talk to your dentist about how to coordinate your teeth whitening treatment with them. Finally, teeth whitening may damage your teeth if you have an active cavity, or in-progress dental work. In the days after your teeth whitening treatment, you may find that your teeth become more sensitive. This sensitivity will probably not last more than a week or two. In the meantime, your dentist may recommend products that contain potassium nitrate and sodium fluoride gel to treat it. Teeth whitening solution may also temporarily irritate your gums if it comes into contact with them. This side effect will likely fade away shortly after your treatment is complete. To find out if teeth whitening is right for you, please contact our Calgary dentists to book a consultation!